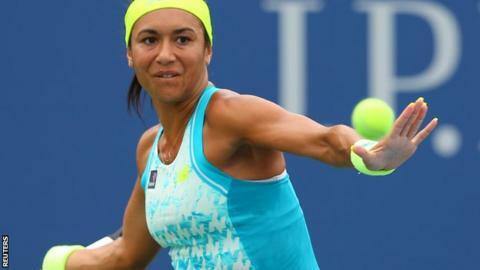 Britain's Heather Watson lost in the US Open first round for the fifth year running as she went down to American Lauren Davis in straight sets. Davis, ranked 23 places lower at 84 in the world, won 7-6 (7-3) 7-6 (7-0) in New York. Watson won the junior title at Flushing Meadows in 2009 but has lost all five of her first-round matches since 2011. The five remaining Britons in the US Open singles begin their campaigns on Tuesday. "I was thinking a lot about this match, thinking that it was a big opportunity and about the previous years and my results here," said Watson. "Maybe I thought about that a bit too much." It was a far cry for her last Grand Slam performance, when Watson lost to Serena Williams on Wimbledon's Centre Court in a match that grabbed national attention. Two months later, she made a swift exit on the remote - albeit well attended - surroundings of court 17 at Flushing Meadows. After losses to Maria Sharapova, Li Na and Simona Halep in previous years, Watson had hoped to make amends for last year's disappointing defeat by Sorana Cirstea. When the draw paired her with Davis, the Briton appeared to have a golden opportunity, but the 5ft 2in American was much the more solid player. "This was a dispiriting defeat for Watson after the promise of the Wimbledon fortnight. Davis played with more conviction and daring: the American was more prepared to go for her shots and ultimately reaped her reward. Watson has had some stand-out results in 2015 - winning her second WTA title and reaching the last 16 at Indian Wells before that Wimbledon run - but will need a strong finish if she is to end the year in the world's top 50." A scrappy contest saw a combined total of 70 unforced errors, but crucially the more daring Davis made 29 winners to 18 over the course of two hours and 10 minutes. "It was an extremely tough match," said Davis. "We both make a lot of balls - I'm surprised it wasn't longer." Watson had an early chance to stamp her authority on the match at 3-2, 0-40, but missed with a backhand on the first break point before Davis then played her way out of trouble. From then on it was the American who looked the more likely, with Watson's first serve and forehand deserting her as the match went on. Davis took control of the first-set tie-break with a terrific drop shot-volley combination at 4-2 and moved 3-1 clear in the second set as the errors began to flow from Watson. With the temperature approaching 30C and humidity rising, Watson faced a gruelling afternoon if she was to salvage her hopes, but she fought back and served for the second set at 5-4. She dropped serve again, however, and Davis raced through the second-set tie-break without dropping a point to break her own duck in the US Open main draw at the fourth attempt. Watson struggled "a little bit" with cramp in her hand as the temperature rose but put that down as much to what was at stake as to her physical conditioning. "I found it quite hot," she said. "I felt fine before the match, but maybe it was a mix of tension and long rallies mixed together." The Briton also conceded that the aggressive style which took her as high as 38th in the world earlier this year had deserted her in New York. "I should have come to the net a lot more than I did," she said. "It's easy looking back now but I didn't execute my game plan the way I wanted to."